Product safety standards contain three primary sets of requirements: (1) constructional specifications related to parts and the methods of assembling, securing, and enclosing the device and its associated components, (2) performance specifications or "type tests" - the actual electrical and mechanical tests to which the test sample is subjected, and (3) production and manufacturing tests which are required on all products. These tests are generally a subset of the performance test. The test methods and the pass/fail limits were established as a basis of providing a margin of safety in cases of misuse and expected single fault component failures. The dielectric barrier protects the user from exposure to dangerous electrical potentials. The most common points of application for a dielectric withstand test are between AC primary circuits and low voltage secondary circuits, as well as between AC primary circuits and user-accessible conductive parts/ground. Confirming that the proper dielectric barrier exists between these areas verifies the existence of a level of protection from electric shock hazards under normal and single fault conditions. A dielectric withstand test (dielectric strength test) appears in nearly every product safety standard and is a fundamental test employed to check a fully assembled product as it exits the production line. Follow this link for more details on dielectric strength or hipot testing. Insulation resistance measurements are generally conducted to determine the actual resistance between the two points of test. 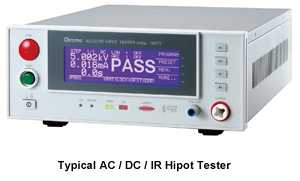 This test is similar to a DC hipot test except that it displays resistance rather than leakage current. It serves as a practical and effective method of verifying suitability of the product for use by the public. Follow this link for more details on insulation resistance testing. Limits on leakage current are significantly less on medical products. The leakage current discussed here is different from the measurement of leakage current during a dielectric withstand or hipot test. During a dielectric withstand test, a high voltage generally greater than 1000V is applied between the hot and neutral lines and the ground of the DUT. The leakage current is then measured. In a leakage current test, the product is on and operating via standard line voltage, such as 120VAC. The leakage current is then measured using a special circuit that simulates the impedance of the human body. 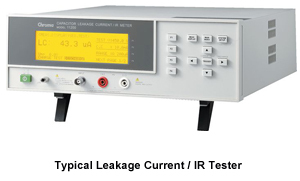 Follow this link for more details on leakage current testing. A ground continuity test checks that a path exists between all exposed conductive metal surfaces and the power system ground. This ground circuit provides the most fundamental means of electrical shock protection for a user. If a fault occurs in the product that causes power line voltage to be connected to a surface a user might touch, a high current will flow through the connection to the power system ground, causing a circuit breaker to trip or a fuse to blow, thus protecting the user from shock. The ground continuity test is normally performed using a low current DC source (<1 Amp) to determine that there is a low resistance between the ground blade on the power cord and any exposed metal on the product. 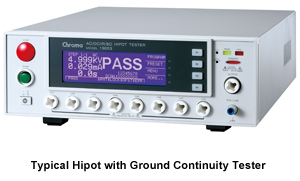 Follow this link for more details on ground continuity testing. If, however, the ground circuit cannot carry enough current or has too high an electrical resistance, the circuit breaker may not trip or the fuse may not blow. If this occurs, voltage can build up to a point where current will flow through the user's body instead of the ground circuit. 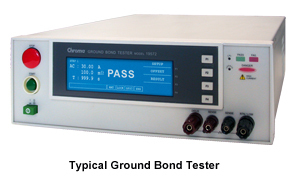 A ground bond test measures the resistance of the ground circuit and verifies the adequacy of the connection. Follow this link for more details on ground bond testing.